Mexico Beach, Florida (June 2017) – Seafood dives across the country draw in connoisseurs of crab, lovers of lobster, and fans of fish from California to Maine. But plenty may not know that some amazing fresh seafood is also found along the Gulf of Mexico’s coast in Northwest Florida. After 20 years of official taste testing, acclaimed food critic Steve Millburg of Coastal Living magazine has compiled the ultimate list of seafood dives in the publication’s May 2017 issue. “The 20 Best Seafood Dives of All Time, Ranked!” includes one of Mexico Beach’s restaurants, Killer Seafood, coming in at number 10. Killer Seafood is a favorite among locals and vacationers alike and is known for its killer fresh fish tacos. Millburg, who has been dubbed “King of the Crab Cakes and Lord of the Lobster Roll,” ranked seafood eateries from coast to coast in his list. His praise for Killer Seafood is due in large part to the dive’s famous Simmerin’ Sauce. “I love lots of joints on the Panhandle, but it’s the homemade sauces at Killer Seafood—especially the tomatoey Simmerin’ Sauce that spices up shrimp and scallops—that merit best in show,” Millburg wrote. It is not the first time Killer Seafood has been recognized for its delicious food; it originally made Coastal Living’s list of top seafood dives in 2010 and again in 2012. Millburg also advised readers to try the “deliciously messy fish tacos; you’ll lick the sauce off your hands.” Killer Seafood’s homemade Simmerin’ Sauce is used in a variety of dishes in the restaurant and can be purchased by the bottle in Mexico Beach as well as through vendors in Northwest Florida, Georgia, Montana, and Rhode Island. Killer Seafood is a staple in Mexico Beach, with something for everyone in the family on their menu, including seafood platters and baskets, fish tacos, po’boys, burgers, and homemade key lime pie. Other incredible eateries on the “Unforgettable Coast” in Mexico Beach include Toucan’s on the beach, which VIE magazine called an excellent destination for seafood lovers that has “an island vibe and dress code to match.” Toucan’s dining room and Tiki Bar have the best views for Gulf-side dining in Mexico Beach. Meanwhile, Mango Marley’s is the place to be during your favorite sporting events. The TVs, wings, burgers, and game day specials make it perfect for fans looking for a place to watch the game while on vacation. The Fish House is yet another seafood staple in Mexico Beach and the homemade gourmet cheesecakes keep guests coming back for more. Owner Erik Spilde and his family put love into every dessert, fried shrimp basket, and bowl of gumbo. The Fish House’s gumbo has even won the grand prize a few times at the annual Mexico Beach Gumbo Cook-Off, which takes place at Sunset Park each February. Breakfast lovers head straight to Sharon’s Cafe in Mexico Beach for pancakes, biscuits, hash browns, and more. The home cooking is served up with all the Southern hospitality you’d expect from owner Sharon Call. Stop by for a cup of coffee and hearty fuel for a day on the beach! Other Unforgettable Coast eateries include Castaways Southern Cuisine, Caribbean Coffee, 40th Street Pizza, Graba Java Café, MB Sweets & Treats, Crazy Beach Pizza, Shoobie’s Ice Cream Truck, and Tommy T’s arcade. This slice of paradise on beautiful white-sand beaches is a foodie’s oasis, too! 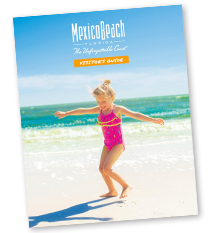 Mexico Beach invites you to come enjoy a taste of the Gulf Coast, any time of year!